Blinded in both eyes as a result of an early childhood accident, Braille mastered his disability while still a boy. He excelled in his education and received a scholarship to France's Royal Institute for Blind Youth. While still a student there, he began developing a system of tactile code that could allow blind people to read and write quickly and efficiently. Inspired by the military cryptography of Charles Barbier, Braille constructed a new method built specifically for the needs of the blind. He presented his work to his peers for the first time in 1824. In adulthood, Braille served as a professor at the Institute and had an avocation as a musician, but he largely spent the remainder of his life refining and extending his system. It went unused by most educators for many years after his death, but posterity has recognized braille as a revolutionary invention, and it has been adapted for use in languages worldwide. Louis Braille was born in Coupvray, a small town about twenty miles east of Paris, on 4 January 1809. He and his three elder siblings – Monique Catherine (b. 1793), Louis-Simon (b. 1795), and Marie Céline (b. 1797) – lived with their parents, Simon-René and Monique, on three hectares of land and vineyards in the countryside. Simon-René maintained a successful enterprise as a leatherer and maker of horse tack. Louis Braille survived the torment of the infection but by the age of five he was completely blind in both eyes. Due to his young age, Braille did not realize at first that he had lost his sight, and often asked why it was always dark. His parents made many efforts – quite uncommon for the era – to raise their youngest child in a normal fashion, and he prospered in their care. He learned to navigate the village and country paths with canes his father hewed for him, and he grew up seemingly at peace with his disability. Braille's bright and creative mind impressed the local teachers and priests, and he was accommodated with higher education. Braille studied in Coupvray until the age of ten. Because of his combination of intelligence and diligence, Braille was permitted to attend one of the first schools for blind children in the world, the Royal Institute for Blind Youth, since renamed to the National Institute for Blind Youth in Paris. Braille, the last of the family's children to leave the household, departed for the school in February 1819. At that time the Royal Institute was an underfunded, ramshackle affair, but it provided a relatively stable environment for blind children to learn and associate together. The children were taught how to read by a system devised by the school's founder, Valentin Haüy. Not blind himself, Haüy was a philanthropist who devoted his life to helping the blind. He designed and manufactured a small library of books for the children using a technique of embossing heavy paper with the raised imprints of Latin letters. Readers would trace their fingers over the text, comprehending slowly but in a traditional fashion which Haüy could appreciate. Braille was helped by the Haüy books, but he also despaired over their lack of depth: the amount of information kept in such books was necessarily small. Because the raised letters were made in a complex artisanal process using wet paper pressed against copper wire, the children could not hope to "write" by themselves. So that the young Louis could send letters back home, Simon-René provided him with an alphabet made from bits of thick leather. It was a slow and cumbersome process, but the boy could at least trace the letters' outlines and write his first sentences. The handcrafted Haüy books all came in uncomfortable sizes and weights for children. They were laboriously constructed, very fragile, and expensive to obtain: when Haüy's school first opened, it had a total of three books. Nonetheless, Haüy promoted their use with zeal. To him, the books presented a system which would be readily approved by educators and indeed they seemed – to the sighted – to offer the best achievable results. Braille and his schoolmates, however, could detect all too well the books' crushing limitations. Nonetheless, Haüy's efforts still provided a breakthrough achievement – the recognition of the sense of touch as a workable strategy for sightless reading. Haüy's only personal limitation was that he was "talking to the fingers with the language of the eye". Braille read the Haüy books repeatedly, and he was equally attentive to the oral instruction offered by the school. He proved to be a highly proficient student and, after he had exhausted the school's curriculum, he was immediately asked to remain as a teacher's aide. By 1833, he was elevated to a full professorship. For much of the rest of his life, Braille stayed at the Institute where he taught history, geometry, and algebra. Braille's ear for music enabled him to become an accomplished cellist and organist in classes taught by Jean-Nicolas Marrigues. Later in life, his musical talents led him to play the organ for churches all over France. A devout Catholic, Braille held the position of organist in Paris at the Church of Saint-Nicolas-des-Champs from 1834 to 1839, and later at the Church of Saint-Vincent-de-Paul. Braille was determined to invent a system of reading and writing that could bridge the gap in communication between the sighted and the blind. In his own words: "Access to communication in the widest sense is access to knowledge, and that is vitally important for us if we [the blind] are not to go on being despised or patronized by condescending sighted people. We do not need pity, nor do we need to be reminded we are vulnerable. We must be treated as equals – and communication is the way this can be brought about." In 1821, Braille learned of a communication system devised by Captain Charles Barbier of the French Army. Some sources depict Braille learning about it from a newspaper account read to him by a friend, while others say the officer, aware of its potential, made a special visit to the school. In either case, Barbier willingly shared his invention called "night writing" which was a code of dots and dashes impressed into thick paper. These impressions could be interpreted entirely by the fingers, letting soldiers share information on the battlefield without having light or needing to speak. The captain's code turned out to be too complex to use in its original military form, but it inspired Braille to develop a system of his own. Braille worked tirelessly on his ideas, and his system was largely completed by 1824, when he was fifteen years old. From Barbier's night writing, he innovated by simplifying its form and maximizing its efficiency. He made uniform columns for each letter, and he reduced the twelve raised dots to six. He published his system in 1829, and by the second edition in 1837 he had discarded the dashes because they were too difficult to read. Crucially, Braille's smaller cells were capable of being recognized as letters with a single touch of a finger. Braille created his own raised-dot system by using an awl, the same kind of implement which had blinded him. In the process of designing his system, he also designed an ergonomic interface for using it, based on Barbier's own slate and stylus tools. By soldering two metal strips across the slate, he created a secure area for the stylus which would keep the lines straight and readable. By these modest means, Braille constructed a robust communication system. "It bears the stamp of genius" wrote Dr. Richard Slating French, former director of the California School for the Blind, "like the Roman alphabet itself". For the first line of his French braille: A to J, Louis Braille invented small and easy patterns for each letter. To create the letters of the second line (K to T), one needs to add a cell in the bottom left corner of A to J. To create the letter of the third line (U,V,X,Y,Z and some French special characters), a bottom right corner cell is added to the previous line. To create the characters of the 4th line, the bottom left corner cell is taken out from the 3rd line, and, in order to form the characters of the last line (punctuation), each pattern of A to J is moved down one cell. The system was soon extended to include braille musical notation. Passionate about his own music, Braille took meticulous care in its planning to ensure that the musical code would be "flexible enough to meet the unique requirements of any instrument". In 1829, he published the first book about his system, Method of Writing Words, Music, and Plain Songs by Means of Dots, for Use by the Blind and Arranged for Them. Ironically this book was first printed by the raised letter method of the Haüy system. Braille produced several written works about braille and as general education for the blind. Method of Writing Words, Music, and Plain Songs... (1829) was revised and republished in 1837; his mathematics guide, Little Synopsis of Arithmetic for Beginners, entered use in 1838; and his monograph New Method for Representing by Dots the Form of Letters, Maps, Geometric Figures, Musical Symbols, etc., for Use by the Blind was first published in 1839. Many of Braille's original printed works remain available at the Braille birthplace museum in Coupvray. 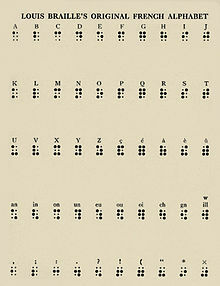 New Method for Representing by Dots... (1839) put forth Braille's plan for a new writing system with which blind people could write letters that could be read by sighted people. Called decapoint, the system combined his method of dot-punching with a new specialized grill which Braille devised to overlay the paper. When used with an associated number table (also designed by Braille and requiring memorization), the grill could permit a blind writer to faithfully reproduce the standard alphabet. After the introduction of decapoint, Braille gave assistance to his friend Pierre-François-Victor Foucault, who was working on the development of his Raphigraphe, a device that could emboss letters in the manner of a typewriter. Foucault's machine was hailed as a great success and was exhibited at the World's Fair in Paris in 1855. Although Braille was admired and respected by his pupils, his writing system was not taught at the Institute during his lifetime. The successors of Valentin Haüy, who had died in 1822, showed no interest in altering the established methods of the school, and indeed, they were actively hostile to its use. Dr. Alexandre François-René Pignier, headmaster at the school, was dismissed from his post after he had a history book translated into braille. Braille had always been a sickly child, and his condition worsened in adulthood. A persistent respiratory illness, long believed to be tuberculosis, dogged him, and by the age of forty, he was forced to relinquish his position as a teacher. Despite the lack of a cure at the time, Braille lived with the illness for 16 years. When his condition reached mortal danger, he was admitted to the infirmary at the Royal Institution, where he died in 1852, two days after he had reached the age of forty-three. Through the overwhelming insistence of the blind pupils, Braille's system was finally adopted by the Institute in 1854, two years after his death. The system spread throughout the French-speaking world, but was slower to expand in other places. However, by the time of the first all-European conference of teachers of the blind in 1873, the cause of braille was championed by Dr. Thomas Rhodes Armitage and thereafter its international use increased rapidly. By 1882, Dr. Armitage was able to report that "There is now probably no institution in the civilized world where braille is not used except in some of those in North America." Eventually even these holdouts relented: braille was officially adopted by schools for the blind in the United States in 1916, and a universal braille code for English was formalized in 1932. New variations in braille technology continue to grow, including such innovations as braille computer terminals; RoboBraille email delivery service; and Nemeth Braille, a comprehensive system for mathematical and scientific notation. Almost two centuries after its invention, braille remains a system of powerful and enduring utility. Braille's childhood home in Coupvray is a listed historic building and houses the Louis Braille Museum. A large monument to him was erected in the town square which was itself renamed Braille Square. On the centenary of his death, his remains were moved to the Panthéon in Paris. In a symbolic gesture, Braille's hands were left in Coupvray, reverently buried near his home. Statues and other memorials to Louis Braille can be found around the world. 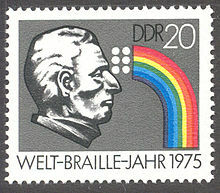 He has been commemorated in postage stamps worldwide, and the asteroid 9969 Braille was named for him in 1992. The Encyclopædia Britannica lists him among the "100 Most Influential Inventors Of All Time". The 200th anniversary of Braille's birth in 2009 was celebrated throughout the world by exhibitions and symposiums about his life and achievements. Among the commemorations, Belgium and Italy struck 2-euro coins, India struck a 2-rupee coin, and the USA struck a one dollar coin, all in Braille's honor. Because of his accomplishments as a young boy, Braille holds a special place as a hero for children, and he has been the subject of a large number of works of juvenile literature. Other appearances in the arts include the American TV special Young Heroes: Louis Braille (2010); the French TV movie Une lumière dans la nuit (2008) (released in English as The Secret of Braille); and the dramatic play Braille: The Early Life of Louis Braille (1989) by Lola and Coleman Jennings. In music, Braille's life was subject of the song called "Merci, Louis", composed by the Halifax singer-songwriter Terry Kelly, chair of the Canadian Braille Literacy Foundation. 'The Braille Legacy', a musical which tells the story of Louis Braille, written by Sébastien Lancrenon and translated into English by Ranjit Bolt, debuted in the Charing Cross Theatre in April 2017. ^ a: It remains uncertain which eye was actually struck first. Most accounts of Braille's accident omit reference to left or right. Braille's American biographer J. Alvin Kugelmass wrote that it was the left eye, but C. Michael Mellor and Lennard Bickel state definitively that it was the right. ^ "Who was Louis Braille". Royal Blind. Retrieved 3 January 2018. ^ a b Weygand, p. 282. ^ a b c Kugelmass (1951), pp. 13–23. ^ a b c d Marsan, Colette (2009). "Louis Braille: A Brief Overview". Association Valentin Haüy. Archived from the original on 7 August 2015. ^ Kugelmass (1951), pp. 24–39. ^ The World Book Student Discovery Encyclopedia, Vol. B2. Chicago: World Book Inc. 2000. p. 117. ISBN 978-0-7166-7400-9. ^ a b c d e Farrell, p. 98. ^ Kugelmass (1951), pp. 34–35. ^ a b c Kugelmass (1951), pp. 37–38. ^ Kugelmass (1951), p. 48. ^ a b Farrell, p. 96. ^ a b c Olmstrom, pp. 161–162. ^ "Église Saint-Nicolas-des-Champs" (in French and English). Universite du Quebec. 2011. Archived from the original on 24 February 2012. ^ Kugelmass (1951), pp. 108–115. ^ "Invention of braille". Royal National Institute of Blind People (RNIB). 2017. Archived from the original on 8 September 2017. ^ Kugelmass (1951), pp. 117–118. ^ a b c Farrell, p. 99. ^ "Louis Braille 1809–1852 : un génie français" (in French). Valentin Haüy Association. 2011. Retrieved 15 February 2014. ^ a b "Books in Braille". Afb.org. American Foundation for the Blind. 2013. Archived from the original on 1 December 2017. ^ Braille, Louis (1839). Nouveau procede pour representer des points la forme meme des letters, les cartes de geographie, les figures de geometrie, les caracteres de musiques, etc., a l'usage des aveugles (in French). Institution royale des jeunes aveugles. ^ "Maison Natale de Louis Braille". Culturecommunication.gouv.fr. Culture-Acte 2. 2013. Archived from the original on 30 June 2017. ^ "Braille Invents His Code: Louis Invents Decapoint". Afb.org. American Foundation for the Blind. 2013. Archived from the original on 3 August 2017. ^ Wace, Barbara; John Peaty. Louis Braille. p. 128. in Clifford Makins, ed. (1961). Girl Annual No. 9. Longacre Press. ^ "The Evolution of Braille" (PDF). Braillauthority.org. Braille Authority of North America. 2011. Archived (PDF) from the original on 30 June 2017. ^ Eliot, T.S. (December 1952). "Some thoughts on Braille". The New Outlook for the Blind. 46 (10): 287–288. ^ "Louis Braille Monument". Louis Braille School, Edmonds, WA. 1996. Archived from the original on 8 June 2017. ^ Kugelmass, J. Alvin (24 February 1952). "That Those Who Are Blind May Read". The New York Times. p. BR26. Retrieved 15 February 2014. ^ Jernigan, Kenneth (1995). "Facts About Louis Braille's Birthplace". Blind.net. National Federation of the Blind. Archived from the original on 8 October 2017. ^ Nuessel, Frank (November 1985). "Louis Braille Helped the Sightless to See". The American Philatelist. 99: 1005–1007. ^ Schmadel, Lutz D.; International Astronomical Union (2003). Dictionary of minor planet names. Berlin; New York: Springer-Verlag. p. 715. ISBN 978-3-540-00238-3. ^ McKenna, Amy, ed. (2010). The 100 Most Influential Inventors of All Time. New York: Britannica Educational Publishing. pp. 94–96. ISBN 9781615300426. ^ "New 2-euro commemorative coin on display in the Museum". National Bank of Belgium. 2009. Archived from the original on 9 November 2017. ^ "Italy 2 euro commemorative coin 2009 Louis Braille". Brailleroom. 2009. Archived from the original on 2 April 2012. ^ "Commemorative Coins – India – Louis Braille". India Stamp Ghar. 2010. Archived from the original on 19 October 2017. ^ "2009 Louis Braille Bicentennial Silver Dollar". United States Mint. 2009. Retrieved 15 February 2014. ^ See Worldcat.org for a complete list of Braille-related literature for children and young adults. ^ "Young Heroes: Louis Braille". Deaftvchannel.com. 2010. Archived from the original on 22 February 2014. ^ "Une lumière dans la nuit (TV 2008)". IMDb.com. Retrieved 15 February 2014. ^ Jennings, Lola H.; Jennings, Coleman A. (1989). Braille: the early life of Louis Braille. Dramatic Publishing. ISBN 978-1-58342-426-1. ^ "Terry Kelly: Merci, Louis". Deaftvchannel.com. Retrieved 7 March 2016. ^ "The Braille Legacy". Charing Cross Theatre. Bickel, Lennard (1989). Triumph Over Darkness: The Life of Louis Braille. Leicester: Ulverscroft. ISBN 978-0708920046. Farrell, Gabriel (1956). The Story of Blindness. Cambridge: Harvard University Press. OCLC 263655. Kugelmass, J. Alvin (1951). Louis Braille: Windows for the Blind. New York: Julian Messner Inc. OCLC 8989771. Lorimer, Pamela (1996). A critical evaluation of the historical development of the tactile modes of reading and analysis and evaluation of researches carried out in endeavours to make the braille code easier to read and to write (Ph. D. thesis). University of Birmingham. OCLC 49619181. Archived from the original on 30 March 2012. Olstrom, Clifford E. (2012-07-10). Undaunted By Blindness. Watertown, MA: Perkins School for the Blind. ISBN 978-0-9822721-9-0. Retrieved 4 December 2011. Reynolds, Cecil R.; Fletcher-Janzen, Elaine (2007). Encyclopedia of Special Education: A-D. John Wiley and Sons. ISBN 978-0-471-67798-7. Mellor, C. Michael (2006). Louis Braille: A Touch of Genius. Boston: National Braille Press. ISBN 978-0-939173-70-9. Weygand, Zina (2009). The Blind in French Society: From the Middle Ages to the century of Louis Braille. Stanford, CA: Stanford University Press. ISBN 978-0-8047-5768-3.